“The Tremendous Sparrowhawks” became irresistible to listeners who saw them live, heard them on the radio, and played their records at home. Both musicians hailed from the northwest border state of Nuevo Leon. By the time they joined forces in 1962, Prado, the elder of the two, had already made a name for himself as part of his family band, Los Hermanos Prado. Torres, though not as famous as his partner, brought formal musical training to the duo, which recorded more than 100 albums in its long career. Salomón Prado Lechuga was born May 13, 1932 in the farming community of Ejido Guadalupe la Joya, near the town of General Terán. He picked up the guitar at age 19 and a few years later began to collaborate with his cousins, Anselmo and Guadalupe Prado, to form Los Hermanos Prado. In 1960, after recording several singles and albums for the Del Valle label, Salomón split from the family act and went on his own. He recorded “Rayitos del Sol” as a solo singer, accompanied by Eugenio Abrego of Los Alegres De Terán, and “Corrido De Monterrey” with his own conjunto, Los Regiomontanos. But wide popularity still eluded him. Juan Torres Perales was born on December 27, 1938, also in a rural community, Ejido Las Trancas, which is part of the municipality of Cadereyta Jimenez, N.L. He came from a very musical family; his father taught him to play the bajo sexto when he was 10, and he also picked up the violin. By age 12, he added the accordion to his suite of instruments. At family gatherings the young, gifted musician performed on a borrowed one-row squeezebox, sometimes known as the German-style accordion, which was becoming popular at the time, especially among country people. In 1954, he left for Monterrey and played for Conjunto del Fraile. A few years later, he formed Los Gavilanes, a precursor of the duet that would make him famous. Prado and Torres joined forces in 1962 at the request of Cristobal García, owner of Del Valle Records, who wanted to record them together. Garcia’s instincts proved prescient. 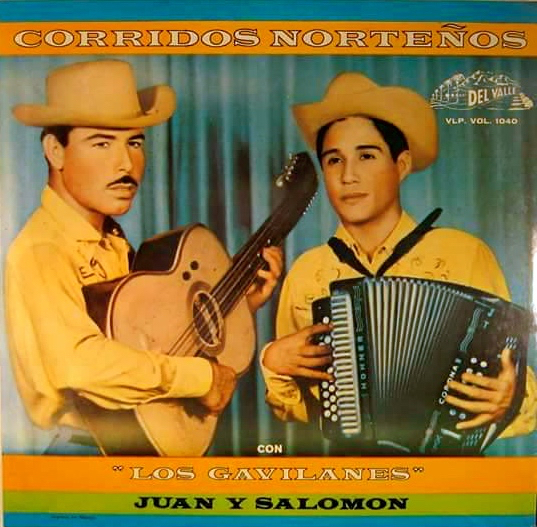 By the 1970s, the two were billed as Los Tremendos Gavilanes, or alternatively Juan y Salomón, to distinguish them from a number of other Gavilanes who were now trying to cash in on their success. In addition to Del Valle, Los Tremendos Gavilanes recorded for various other local independent labels – Bernal, Magda, Falcon, CR, Freddie, Joey, Rovi, DLV, El Zarape, SonArt, Capri and Del Bravo. According to a Facebook page set up for the band, Prado and Torres also recorded with other musicians, some famous in their own right. Prado, for example, formed part of a group called Los Rancheros del Norte along with Eugenio Abrego of Los Alegres de Terán and Ramiro Cavazos of Los Donneños. He also recorded as Salomón Prado y su Pokar de Ases and Los Tremendos Prado, along with his cousin Anselmo. For his part, Torres recorded in other musical pairings as El Relampago y El Gavilán with Cornelio Reyna, El Invasor y el Gavilán with Eduardo Mora of Los Invasores de Nuevo León, and El Coyote y El Gavilán with Alfonso Villagomez of Los Coyotes del Rio Bravo. The Facebook page credits other musicians who played with Los Tremendos Gavilanes, including bassist Jose Luis Prado, drummer Severo Montoya and Salomón Prado Jr., also on drums. The Frontera Collection contains scores of songs – corridos, polkas, boleros, cumbias, rancheras – that were recorded by the duo under half a dozen variations of their name. At some point, they both adopted the band name under their own leadership: Los Tremendos Gavilanes de Salomón Prado and Los Tremendos Gavilanes de Juan Torres. The collection also features those early recordings by Prado as a solo act. Prado sang and played accordion well into his later years. He passed away in December of 2012, at the age of 80. A mournful fan broke the news to members of an Internet chat page linked to Reyes Accordions. Referring to Prado as”El Gavilán Mayor,” the fan noted the musician’s loss was marked by a musical tribute, a performance by Beto Zapata of the duo’s hit “Miel Amarga,” or Bitter Honey. In one of his last formal stage appearances, Prado himself sang the song, accompanied by the popular, contemporary norteño group, Pesado. Sporting a silver beard, a black hat and a rakish scarf, the veteran singer acknowledged the crowd’s cheers with a modest victory gesture, the brief and tentative pumping of his arms. In plaintive tones, he sings the lyrics so typical of Mexican country music, about a heart-broken person forced to accept a cruel fate. Cando siento que una nueva pena me viene a agobiar. Pos que siga haciéndose tu voluntad. Prado is survived by his long-time partner who, though looking frail, is seen performing in a recent video posted in March on the duo’s Facebook page. Torres still displays the musicianship and lively spirit that fueled the long flight of Los Tremednous Gavilanes.